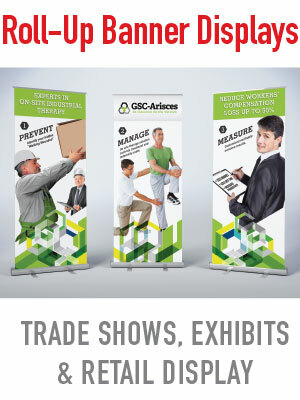 Retractable banner stand are a great way to display your graphics at an event or even right in your own lobby. They are a very compact, convenient and affordable way to display your message, brand or both. A miniature banner stand can be small enough to fit on a table or counter top, although the average size for most full-size banner stands is approximately 33 inches wide by 7-8 feet tall. These handy pop-up displays come in either one or two-sided models and an extra-wide width of 47 inches. BEFORE YOU PURCHASE A BANNER STAND… HERE ARE SOME THINGS YOU SHOULD KNOW. 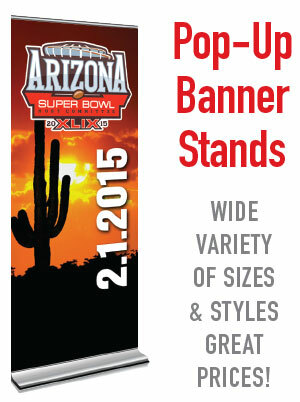 • There are really only three components to a banner stand; the hardware, the vinyl material, and the print quality. • If you are only going to use the display once or twice fro a short period of time, it might be okay to cut back on quality. But… if you want a unit that is going to last awhile, MAKE SURE to spend the extra money to get good hardware, you'll be disappointed if you don't. Beware of discount websites selling these products at super-low prices. The hardware is miserable at best, and print quality is on the low-side as well. • Make sure you measure the location where the Banner stand will be displayed very carefully. Most of the less-expensive banner stands do not have the ability to adjust in height, they must extend all the way to their maximum to work. If your space requires a specific height, make sure to request a variable-height Banner Stand.